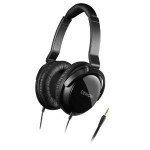 Amazon offers its Prime members the Denon Over-Ear Headphones, model no. AH-D310, for $18.36 with free shipping. Non-members can spend over $25 to qualify for free shipping; otherwise, shipping is $6.17.